Garden work can be demanding and physically straining, especially if you don’t have the right equipment. There are many different garden tools on the market and many of them do very specific jobs which means that you need several different tools if you do a lot of gardening in your yard. When it comes to cutting down plants quickly and easily, a garden machete can sometimes be the best tool for the job. These come in several different sizes so you can find one that meets your gardening needs. Garden machetes can be very useful, especially if you’re trying to get control of an overgrown yard. Machetes are very sharp and should be used with caution. If you’ve never used one before it can be helpful to read any instructions that may come with your machete so you know how to use it safely. 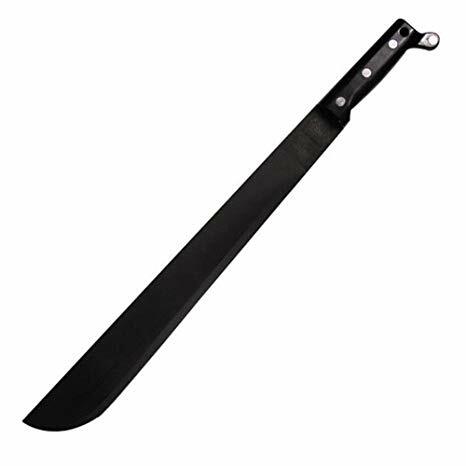 When choosing a garden machete you should look for one that has a good handle and a sharp blade. The following is a list of the 10 best garden machetes based on reviews by consumer report. The Gerber Gator Machete JR is compact and easy to use, especially for those not experienced with using a machete. This tool works well for gardening projects or back country travel where you need a compact tool for removing brush and debris. The sharp blade has a fine edge for brush and vines. Plus, the serrated edge on the other side can be used for sawing small trees. The shaft is made of high carbon steel for durability and the Gator Grip keeps the tool firmly in your hand as you work. 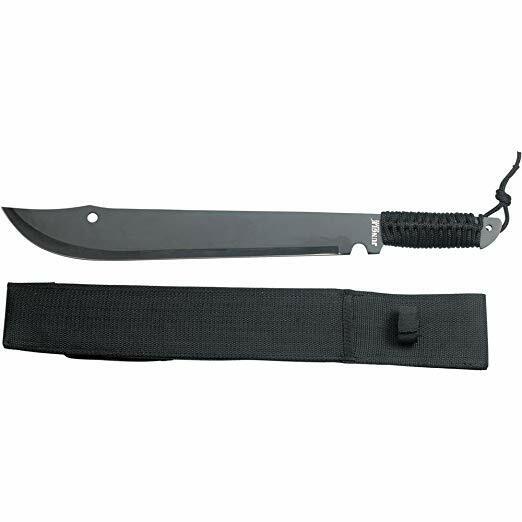 The Ontario 18″ Military Machete has a high quality carbon steel blade that stays sharp even after lots of use. This machete has a military issue design that makes it easy to use for various types of gardening jobs. The molded plastic handle is durable and easy to grip. The sturdy design and full tang blade means that you can do heavy duty chopping and cutting of trees, vines, shrubs and other foliage in your yard with little effort. This machete from Condor Tool & Knife has a 15.5″ blade and an overall length of 22.25″ making it useful for many garden tasks. The blade on this machete is made from 1075 high carbon steel which is durable and designed to stand up to heavy duty usage without breaking. 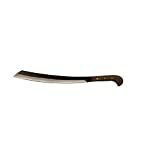 The machete handle has a beautiful hardwood finish with a decorative element. It comes with a hand crafted welted sheath to store the machete and keep it safe while you’re not using it. 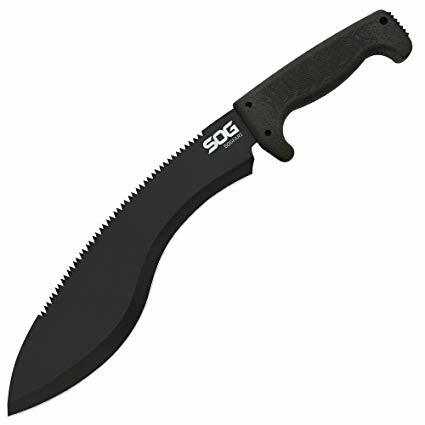 The SOG SOGfari machete has a compact size making it ideal for small garden projects. This 10″ machete is dual sided with a saw on the back to saw through larger limbs. The blade is sharp and made of black steel for durability. The spiked tang design makes it work well for pounding and scraping so you don’t have to worry about damaging your machete during heavy duty work. The machete has a black Kraton handle that’s easy to grip and designed to last. The Cold Steel Kukri Machete is an affordable option that has a super sharp blade so you can use it for many tasks. This machete is 18″ long with a 13″ steel blade. It’s designed to be balanced so you can work more efficiently. 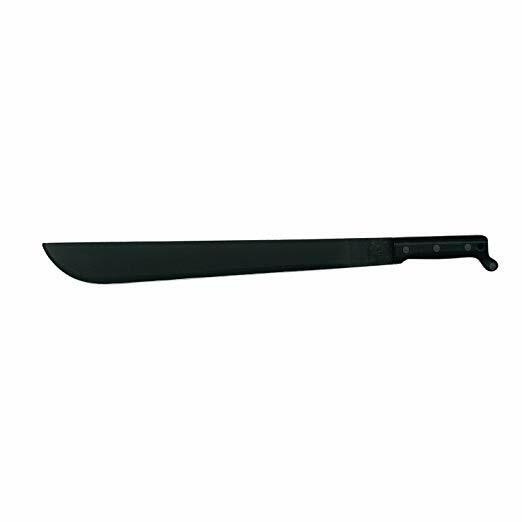 The machete has a strong and durable polypropylene handle with a textured grip. It comes with a Cor-Ex sheath to protect the blade and keep it secure while you’re not using it. The machete also includes a limited manufacturer’s warranty. The Jungle Master machete has a full-tang design for long-lasting power that will help you complete many different gardening jobs. This machete is budget-friendly and easy to use with the cord-wrapped handle. It also includes a sheath so you can store the machete when you’re not using it to protect the blade from dulling. 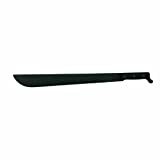 This machete is 21″ long overall with a stainless steel blade that’s sharpened to precision so you can cut through different foliage. The KA-BAR Kukri-style machete has a textured handle that’s made of 100% synthetic materials to give you a firm grip during heavy duty work. This machete has a durable and strong carbon steel blade that’s extremely sharp so you can cut vines, branches, and other foliage in your yard. It could make quick work of tough weeds in your yard and would also be an ideal tool for camping or hiking in the back country where you need to clear a trail. This Kukri machete from SOG has a 12″ carbon steel blade with dual sides. The saw side can be used for sawing small branches or trees while the smooth side can be used for hacking weeds and other debris. The SOGfari is ideal for yard work and can also be used for camping or hiking. It includes a nylon sheath to protect the blade when you’re not using it. The Kraton rubber handle is textured to give you a good grip while you’re working. The Ontario Knife Co Military Machete has a simple design with an overall length of 24″. 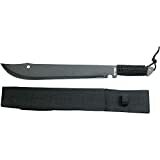 This military style machete has a sharp blade made of 1095 carbon steel so you can easily hack through many different types of foliage in your yard. The handle is riveted to the blade and is made of molded plastic. The 18″ blade on this machete has been hardened to 50-55 HRC so you know you’re getting a quality tool with a blade that’s made to last. 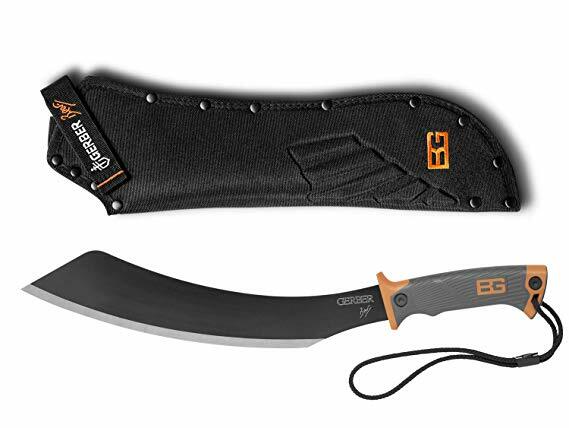 The Gerber Bear Grylls Parang Machete has a unique angled blade that works well for clearing weeds or brush. 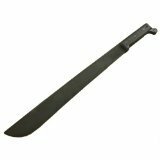 This machete has a robust high carbon steel blade for strength. The blade is resistant to corrosion and is easy to sharpen once it gets dull from use. The handle on this machete has an ergonomic design with a textured rubber grip for comfort. The machete includes a sheath for storage and also has a lanyard to help you keep a secure grip. 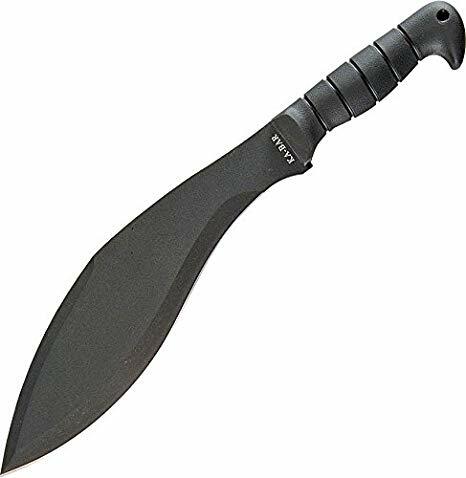 While many people may not consider a machete to be an essential garden tool, they can actually be quite useful. The sharp blade on a machete is ideal for chopping through weeds and brush to help you clean up an overgrown area in little time. 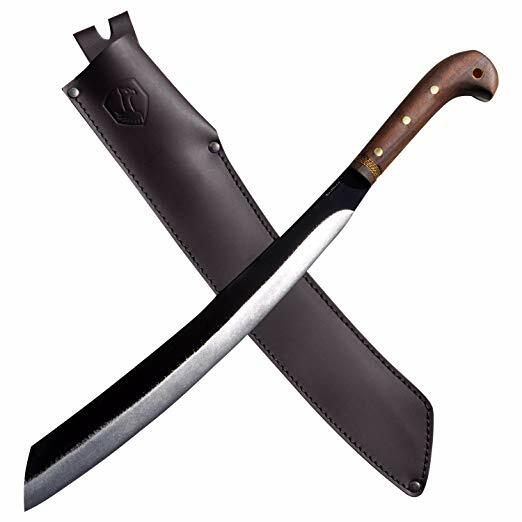 Machetes are also useful for camping or hiking in areas where you need to clear a trail or a campsite. When shopping for a good machete you should look for one with a strong blade that can easily be sharpened. It can also be helpful to read online consumer reviews to help you find one that’s designed to last.